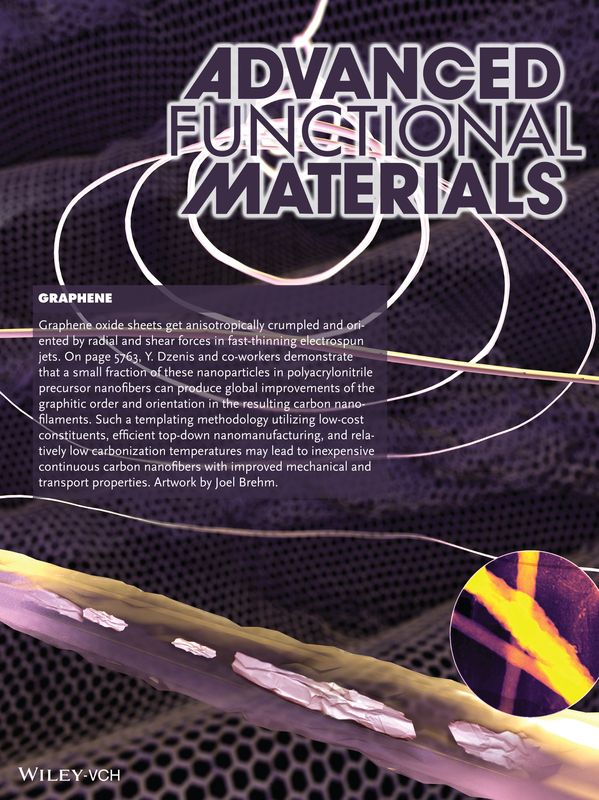 An illustration of the UNL team's research is featured in one of the frontispieces of the Dec. 10 issue of Advanced Functional Materials. The team, led by Yuris Dzenis, McBroom professor of mechanical and materials engineering and a member of UNL's Nebraska Center for Materials and Nanoscience, learned that using a small amount of graphene oxide as a template improves carbon nanomaterials which, in turn, promises to improve composite materials. Composites are used in everything from airplanes to bicycles and golf clubs. Graphene is a one-atom thick layer of carbon with a crystalline structure that makes it exceptionally strong and an excellent heat and electrical conductor. It was the subject of research that earned the 2010 Nobel Prize in Physics. UNL engineers collaborated with researchers from Northwestern University and Materials and Electrochemical Research Corp. of Tucson, Ariz., on this study. The UNL team developed a process to incorporate graphene oxide nanoparticles as a template to guide the formation and orientation of continuous carbon nanofibers, which should improve the fiber's properties. That process involves crumpling the graphene, like crumpling a sheet of paper, in a way that improves graphene as a templating and orientation agent. Only small amounts of crumpled graphene nanoparticles are needed. A group led by chemist SonBinh Nguyen of Northwestern synthesized the graphene oxide. "Many people are trying to put as much graphene as possible into fibers," Dzenis said, adding that it is difficult to do. "But we did the unconventional thing: We used very small quantities followed by carbonization." The resulting carbon nanofiber structure has an orientation similar to fibers with demonstrated enhanced strength and other properties, Dzenis said. He and his colleagues are now testing their graphene-based nanofibers for these enhanced properties as well as improving the technique. The method is promising, he said. It could lower the cost of making composites significantly because it requires only small quantities of expensive nanoparticles and uses an inexpensive nanofiber manufacturing process, which was developed at UNL. "All of this has potential for high-performance but, at the same time, low-cost carbon nanofibers," Dzenis said. The team reported its findings in the Dec. 10 issue of Advanced Functional Materials. Co-authors are UNL mechanical and materials engineering colleagues Dimitry Papkov and Alexander Goponenko; facilities specialist Xing-Zhong Li of the Nebraska Center for Materials and Nanoscience; Owen C. Compton, Zhi An and SonBinh T. Nguyen of Northwestern; and Alexander Moravsky of Materials and Electrochemical Research Corp. This research was funded by grants from the U.S. Army Research Office Multidisciplinary University Research Initiative, Air Force Office of Scientific Research and the National Science Foundation.